The perfect biography for Dog lovers, The Pug List is a story of the healing power of a pug when a friend is most needed. "What if a wheezing, sneezing, allegedly house-trained, ticking time bomb of an orphan pug is the key to helping a family feel at home again, after an arsonist set their house-and life-on fire? If you asked me, I would have said it's a bad idea; we can do better. Unfortunately no one asked me, and The Pug List is my family's story." In the fire's aftermath of insurance battles royal, rebuilding plans, parenting in the face of life's hard questions and a scorching case of post-traumatic stress, now is absolutely the worst possible time to adopt a dog. But to Alison's seven-year-old daughter, Eden, it's the perfect time--and The Relentless Campaign begins. 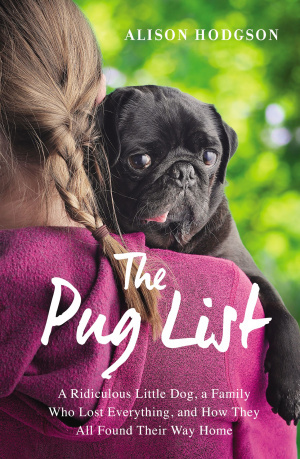 Until one day Alison peeks inside Eden's diary-dubbed "The Pug List"-and realises in one fell swoop that her girl's heart is on the line, and resistance is futile ("The pugs make me happy FOREVER."). Enter "Outrageous" Oliver, and the hilarity, healing, and irresistible hope that follows. The Pug List by Alison Hodgson was published by Zondervan in April 2016 and is our 18516th best seller. The ISBN for The Pug List is 9780310343837. Be the first to review The Pug List! Take a peek at some articles related to The Pug List. Got a question? No problem! Just click here to ask us about The Pug List.